On one of the our research trips to the National Administration and Records Administration visits (NARA), we looked through the files of Supreme Command Allied Powers (SCAP) during the American Occupation of Japan. This letter, from the Texas Game, Fish, and Oyster Commission caught our eye. 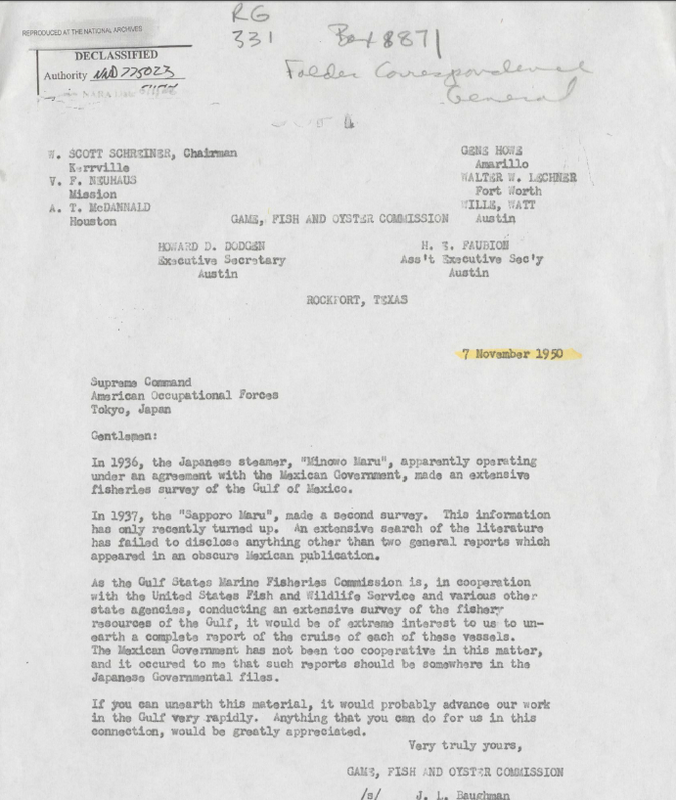 It was written to the the Americans stationed in Japan, seeking any of the research that might have been done by the Japanese in the Gulf of Mexico in 1936-37. The research may have been done in cooperation with the Government of Mexico. The letter is interesting, another chip of evidence about how little oceanographic work was being one by both the federal and state governments before World War II. The Japanese, on the other hand, were fishing through the Pacific and into the Atlantic during the 1930s, efforts that turned them into the world’s leading fishing nations. 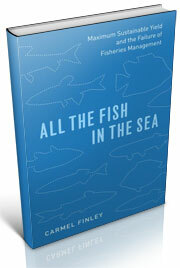 It was not until after the war that the Americans organized fishery research on any sort of scale. 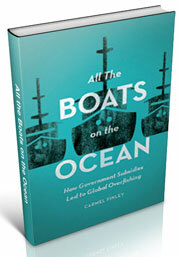 Bob Hitz had untangled the construction of four of the first fishery research vessels in the US, the Oregon, the Washington, the California, and the Alaska. We have known for some time that the first of the vessels, Oregon, was sent to the Gulf of Mexico to participate in the Gulf Exploratory Fishery Program, and it obviously played an important role in the development of Gulf fishing. 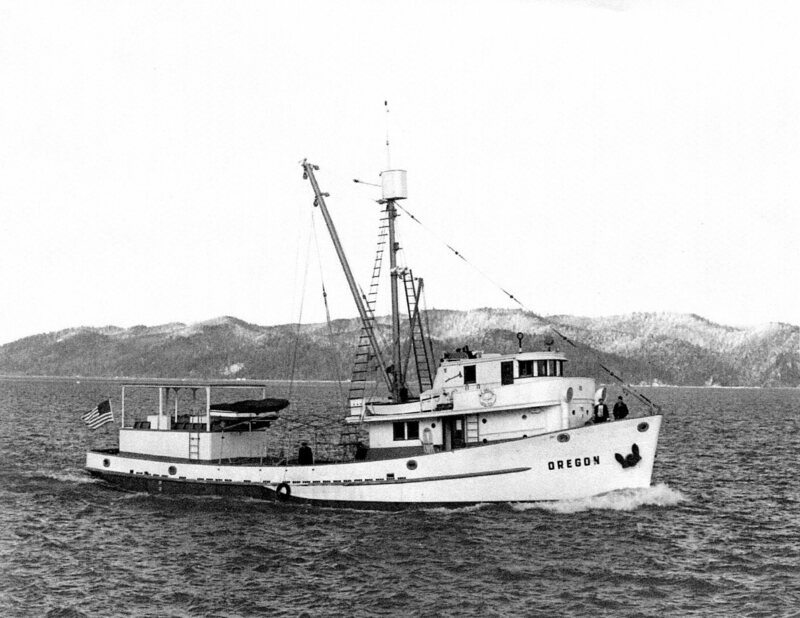 According to the August of 1954 issue of the Commercial Fisheries Review, the Oregon spent six weeks looking for yellowfin tuna (Thunnus albacares). More than 3,000 pounds of yellowfin tuna were unloaded at Pascagoula, Miss. 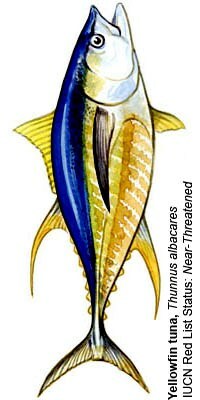 The tuna averaged 118 pounds each and were found over a wide expanse of the western Gulf, thus indicating a broad distribution at this season of the year. 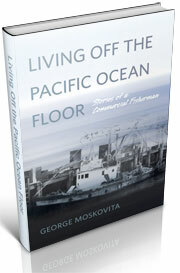 The federal government played a large role in the development of post-war fisheries, not only here in the Pacific Northwest, but throughout the country. This entry was posted in boat building, Environmental History, Exploratory Fishing Base, fisheries science, Fishing, History of Science, History of Technology, Japanese fishing, Nick Bez, Pacific Fishing History Project, SCAP and tagged "Sapporo Maro" "Minowo Maru", and Oyster Commission, Bob Hitz, Fish, Fishing, groundfish, Pacific Fishery History Project, Texas Game, yellowfin tuna. Bookmark the permalink. Fascinating information! The Japanese went to the Gulf of Mexico in the mid 1980’s to survey Squid stocks also. Can we use them on the blog? Want to write something yourself? Bob will be so pleased! Absolutely. What email address shall I send them to?